Westerham Town Partnership in association with St. Mary’s Heritage Trust presents a poignant evening of poetry, songs, readings and personal letters to Westerham, from The Front. 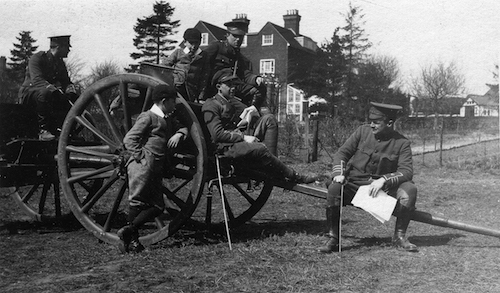 This is an opportunity for Westerham’s residents to commemorate the centenary year of the end of the Great War when the guns finally fell silent. Fifty of Westerham’s sons, husbands and fathers were either killed in action or lost through illness or their wounds. This evening is a tribute to them and to the Westerham women who took over jobs they had never imagined they would have to do. They worked in garages, factories and fields, nursing and supporting shattered men, whilst coping with their own fears for their menfolk, their community and the future. Profits will go to Westerham Town Partnership for future town projects, St Mary's Heritage Trust and to the Orpheus Centre, whose extraordinary soprano soloist, Sandra Gayer will be taking part. Doors open 7pm when canapés and a glass will be served. Tickets online £22 or £17 at www.visitwesterham.org.uk or from Ibbett Moseley box office.